Mariposa Homes & Land Co.
Cathey's Valley home just 50 miles from Yosemite National Park! This 2 bedroom 3/4 bathroom home is on 1.9 acres of property with horse stables and outdoor storage units. Mature landscaping surrounds the home and there is a spa located on the patio deck. The newly remodeled kitchen offers distressed hard wood floors, tile counter tops,custom cabinets with copper detailing on the front, a copper farmhouse sink and stained glass windows. The living room boasts slate floors, a stained glass skylight and a wood burning stove. The newly remodeled bathroom has slate floors, a large walk-in slate shower with stained glass windows and a small electric fireplace. There is a separate non-permitted detached building used as an extra bedroom on the property as well. 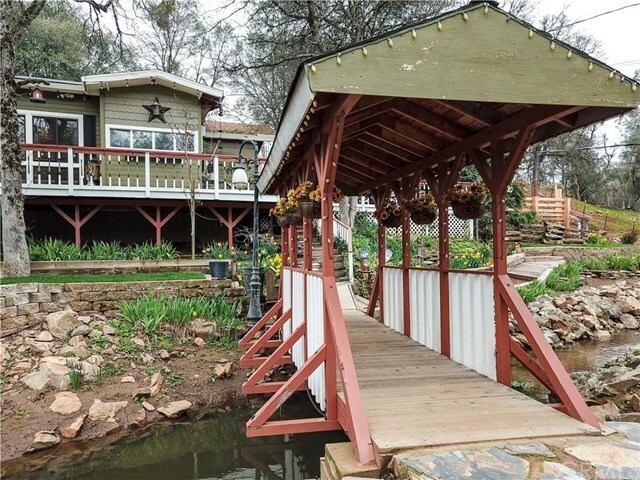 This home is a gem located in the quiet foothills of Mariposa County! Based on information from California Regional Multiple Listing Service, Inc. as of 2019-04-22. This information is for your personal, non-commercial use and may not be used for any purpose other than to identify prospective properties you may be interested in purchasing. Display of MLS data is usually deemed reliable but is NOT guaranteed accurate by the MLS. Buyers are responsible for verifying the accuracy of all information and should investigate the data themselves or retain appropriate professionals. Information from sources other than the Listing Agent may have been included in the MLS data. Unless otherwise specified in writing, Broker/Agent has not and will not verify any information obtained from other sources. The Broker/Agent providing the information contained herein may or may not have been the Listing and/or Selling Agent.